With all the heartwrenching horrendous kick-you-in-the-gut stressful days you will undoubtedly experience as a writer, you’re in need of a little pick-me-up from time to time. So . . . when alcohol crying chocolate beagle snuggling exercise doesn’t quite get those endorphins a-flowin’, I have another solution for ya: a “Worth Saving” e-mail folder. I’ve been keeping one for a while—it’s just an extra e-mail folder where I store e-mails that give me the warm fuzzies. I’m not talking forwards here—unless that’s your thing—but anything that makes you feel . . . well, good. Even as I’m typing this, I’m like, “Ricki, that is the corniest thing I’ve ever heard—and what’s even worse? You’re announcing it on the Internet.” But, when you’re writing full time, you need corny, people. Deal with it. 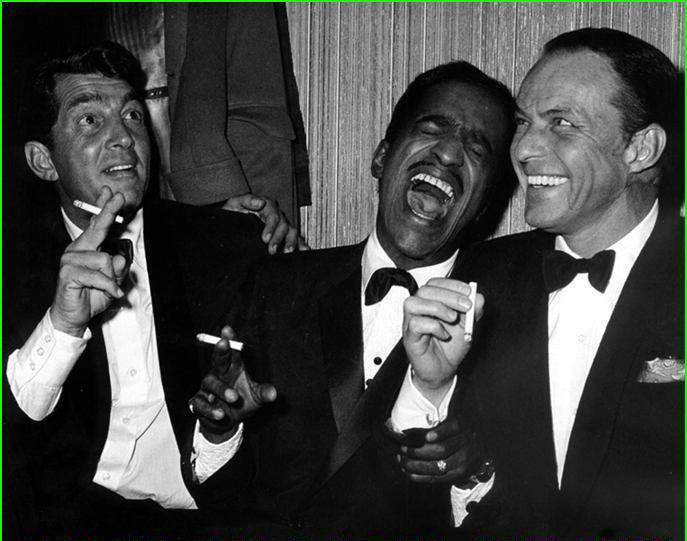 That pic of the Rat Pack gave ME the warm fuzzies. And a smile. Thanks! I love this idea! A few years ago I used to print out funny snippets of emails or text messages from friends and then tape them to my wall…and then when I was *really* bored, I’d rearrange them and make funny sentences that had absolutely nothing to do with anything (like those fridge magnets). And then my cat ripped them down. That sounds super fun! Aw, come on, cat! !